Green moong dal curry with brown rice is a wholesome and delicious meal. The whole green moong dal (also known as mung beans) are highly nutritious and also one of the most widely available lentil varieties. 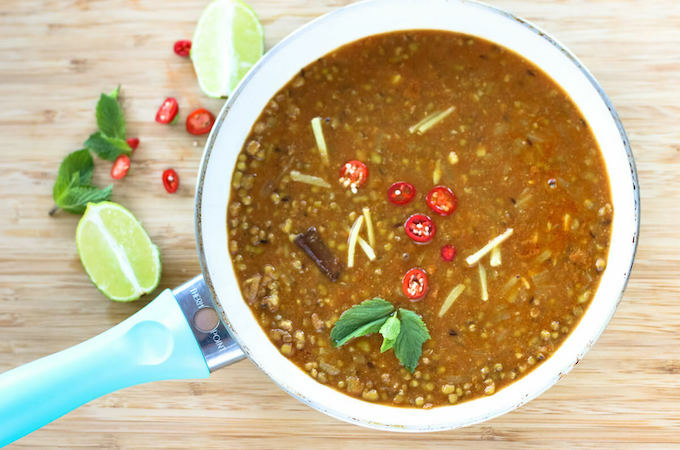 This recipe is a traditional Indian mung bean curry recipe made with whole spices and a base of onion and tomatoes. Whole green moong dal has an earthy taste and in this recipe the flavours are enhanced by cooking with whole spices like cinnamon, bayleaf, peppercorns and cloves. Unlike yellow moong dal or moong dal chilka, each bean stays firm even after long cooking, making it ideal for curries, lentil salads and of course sprouting. This time in our Goa vacation we explored traditional Goan cuisine — xacuti, cafreal, sannas, saansav etc. Very delicious but by the 4th day I needed some comfort food and cooked some green moong dal-chawal at the apartment we were staying at :-). Whether it is a long day or a long travel one is coming back from, there is nothing more comforting than a warm bowl of lentil and rice. No matter where we go and how much fusion and international food we eat, after some 3-4 days, every Indian (especially North Indian) will start to crave for the familiar taste of dal or lentil curry. For many traditional Indian lentils, one needs to find an Indian store, but the green moong dal is one of the most widely available lentils. I’ve lived in many countries and I’ve always found the mung beans (and also red lentils or lal masoor in all local supermarkets. In India, we have a large variety and sub-varieties in lentils. Moong dal or mung bean is one such lentil. It is used as whole green, split but not skinned as well as skinned yellow mung dal. As are the varieties so are the plenty of lentil recipes. 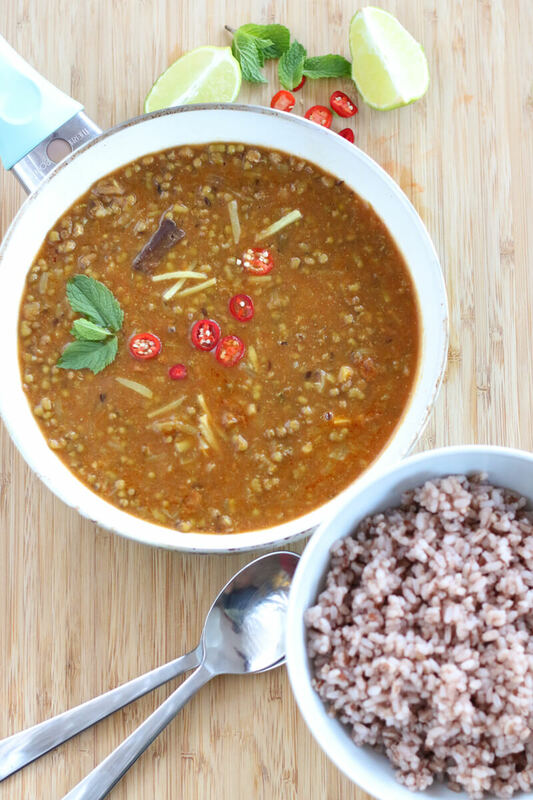 Even a simple lentil curry recipe with each is different in taste and preparation. 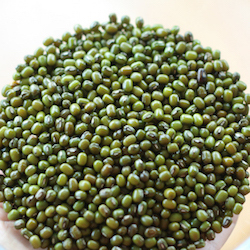 Mung bean is a rich source of protein. 100g of mung beans has 24g of proteins. The whole green moong dal with its skin has a lot more nutrition than skinned yellow moong dal. Along with proteins, green mung bean is rich in dietary fiber, antioxidants, and phytonutrients. Because of its high nutrient density, whole green mung beans help fight against many diseases including cancer, diabetes, heart diseases, and obesity. Why should lentils be soaked before cooking? All dried lentils cook better when soaked for 1-2 hours before cooking. Soaking lentils, pulses, and beans reduces their cooking time and also ensures that they can be easily digested and their nutrients are better absorbed in the body. Whole lentils like green gram and black gram and other legumes like chickpeas, kidney beans etc need longer soaking times of about 6-8 hours (best overnight). If you like this recipe, please take a moment to rate it and/or leave your thoughts in comments. It will really encourage me to keep exploring, learning and improving. Whole green moong dal has an earthy taste and in this recipe the flavours are enhanced by cooking with whole spices like cinnamon, bayleaf, peppercorns and cloves. Unlike other lentils, mung bean stays firm even after long cooking making it ideal for curries, salads and sprouting. Wash the moong dal under running water and then soak in 3 cups of water for at least 4 hours (or overnight). Drain and add the dal to a pressure cooker. Add 3 cups of water, some salt, and ½ tsp turmeric. Close the lid and pressure cook the dals on medium-high heat for 3-4 whistles (about 10-15 mins). Remove from heat and open the cooker only after all the steam has escaped on its own. Alternately cook them in a stock pot for about half an hour until the dals are tender. While the dal is cooking, heat ghee/oil in a separate pan. Once the ghee is hot, add asafoetida, cumins seeds, cinnamon, cloves, peppercorns and bayleaf. Sauté for a minute. Add garlic, ginger, and onions. Sauté for 2-3 minutes till the onions start to turn soft and translucent. Add the tomato purée, turmeric powder, coriander powder, and salt. Mix well and cook open for another 5 minutes till the onion-tomato mix is cooked. Once the dal is cooked, add the onion-tomato mixture to the dal. Mix well. Cook for another couple of minutes. Garnish with fresh ginger, coriander leaves, and red chilies and serve hot with rice or roti. If you don't have the whole spices, you can use 1-2 tsp of garam masala powder. If you try this recipe or if you have more homemade date bar recipes to share, I would really love to know. Tag your picture with #weekendkitchen on instagram or connect with me on Facebook, Twitter, Google+, and/or Pinterest. Or join our newest journey into Recipe Videos. Yummy, this Sabut moong dal is new to me! You make it look so tasty and I can’t wait to make your recipe!! I love trying new dishes! you might know it as green lentils or whole mung beans. These are the same that are used to make sprouts too. “Sabut” is a hindi word that means Whole. I have been exploring some Goan dishes and will be posting my version of chicken xacuti soon. I love all the flavors in curries and lentils are some of my favorite to pickup at my local international market. Thanks for all the tips on the varieties of lentils! Thanks Analida for your comment and rating! 🙂 I was totally blown by the local Goan cuisine.. Will wait for your xacuti recipe so that I could try a veg version of it! i eat a lot of lentils…and will definitely have to give this one a try. I’ve never tried mung beans, but I love the spices, so I’m sure I would love this. we make this often. But ths one so different and yummy. Nvere tried bay leaf with lentils before.Will try this way soon. Aren’t lentils such a wonderful part of Indian cuisine? I love how bayleaf brings out the earthy flavours of the whole mung dal. I haven’t eaten mung beans in years. I loved them as a kid. Can’t wait to get some and try this soon. you should definitely give them a try again! 🙂 Thanks so much for your comment and rating. Let me know if you have any questions in the recipe when you try! I love mung beans but have never eaten them in this way. This sounds like such a yummy, warm, comforting meal. Thanks Dominique! Do try them this way.. you can pair them with rice or even serve it as a soup! You got me at dal. I’m a huge fan of lentils – any lentils actually and I gotta try this recipe soon. I buy moong dal / mung beans at the Indian store near me to use for sprouting, and wanted to cook some as well. The only recipes I’d seen, though, were for the split dal, and I knew it would behave differently… Now I have more options! You should definitely try this recipe. The whole mung beans take longer to cook and hence need to be soaked for a longer time as opposed to split dals. Let me know when you try it! 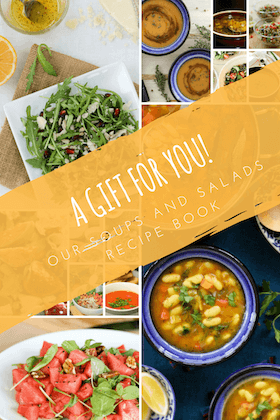 I’m really looking to get more into using dried beans and legumes to make healthy soups and stews. This looks perfect! Thanks for sharing a great recipe. 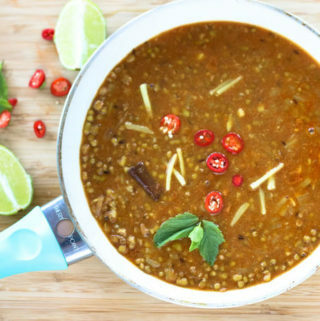 You can serve this mung bean curry as a soup as well. It is very filling and perfect for a one pot meal. This looks SO authentic!! I’ve always always always wanted to make a good authentic Indian meal and this looks like the perfect one to start out with! Where can I get the sabut moong dal green mung beans and the asafoetida? Does Amazon carry them or do I need to go to an Indian grocery? Thanks so much for your comment and rating! You will both green mung beans and asafoetida in the Indian store but Amazon also carries them. Mung beans are available in regular grocery stores also. If you can’t find asafoetida, you can omit it. In Indian cuisine, we always add a pinch of asafoetida as it is a great digestive but such a tiny amount doesn’t change the taste so much. My fiancee is a big curry fan and I am always looking for new recipes to try, especially authentic ones like yours. I’m particularly partial to bayleaf, can’t wait to try this! Thanks for sharing it. I hope he will like it as much as we do 🙂 Do let me know when you try it. Thank you so much for your rating! I’m trying to eat more vegetarian type food and indian food is wonderful for good simple recipes. I am so glad that you “deviated”. Especially in Indian cooking, I believe a recipe is a guideline and it should be adapted to individual tastes and also feelings at the time of cooking 🙂 If you like it spicy, add more chilies; if you want to make it into a more substantial soup or even curry add more veggies and of course fresh herbs — each adds a different flavor! Vegetarian food is really versatile and Indian cuisine provides so many options with simple ingredients. I am glad I could be part of your journey towards a more sustainable diet through this recipe. Please do let me know if you have any questions or if you would want any suggestions on recipes. Do let me know how it goes 🙂 Happy Cooking!